After realising her potential last season with two major international medals, middle distance runner Laura Weightman insists confidence is high ahead of a tilt at World Championship success this year. The Lesbury runner enjoyed a memorable summer last year, winning Commonwealth 1500m silver in Glasgow before following that up with bronze at the European Championships in Zurich. 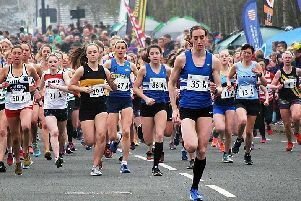 For the 23-year-old Morpeth Harrier, the results reinforced her belief that she belonged at the top table of middle distance running, a stance she intends to show again at this August’s World Championships in Beijing. Laura failed to make it out of the heats on her Worlds debut in Moscow two years ago after struggling with the after-effects of a fall suffered at the British Championships in the build-up. But with a solid block of training in Kenya already under her belt for 2015, Laura, who will contest a series of road races before heading into the outdoor season, insists it’s all systems go for China. “It was really good to get out to Kenya for five weeks after Christmas and New Year and get that block of training in,” she said. “It’s something I’ve been doing for the last four weeks now and I’ve really been seeing the benefits. “Last year was really exciting for me and it was a great to pick up the two medals at the Commonwealths and Europeans. It gave me a lot of confidence that I could compete with the best in the world and it was a great stepping stone to going into this year’s Worlds. “It’s a big target for me this year and the last major championships before we get into an Olympic year. The 1500m is so strong at the minute but last year showed that anything can happen at a championships. Laura finished 11th on her Olympic debut in London, just five years after adding a second consecutive 1500m gold at the Sainsbury’s School Games in Coventry. In addition to being the Major Event Series partner of British Athletics, Sainsbury’s sponsors the Schools Games, which sees millions of school children, take part in competitive sport each year, with 1,600 young elite athletes competing annually in a high level multi-sport event. And Laura admits the experience gave her a vital foundation in terms of adjusting to the multi-sport environment. “I remember the School Games being a really fun event and that it was so exciting to see the various different athletes in different sports,” she added. “I think that’s a really important learning experience and is gives you that feeling of what a multi-sport event feels like. “I was so young when I went to London in 2012 and nothing can really prepare you for that big stage but the School Games at least gives you a taste of how it all works, with different sports, staying in a village. Sainsbury’s is a proud partner of British Athletics. The partnership reflects Sainsbury’s wider commitment to inspiring healthy lifestyles for all, and complements grassroots campaigns such as Active Kids and the Sainsbury’s School Games.